Wow, Girlfriends’ status as a ground-breaking TV drama was cemented yesterday when it was featured on ITV News at Ten. 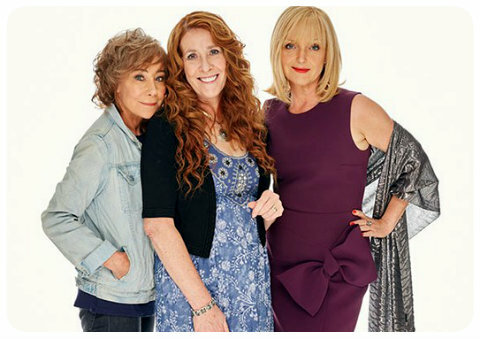 The report by arts editor Nina Nannar emphasises that by focusing on women in late middle age, the series sheds light on challenges faced by a group of people who often feel overlooked by British TV. As Girlfriends’ creator Kay Mellor explains, ‘I wanted to say something about real women that are of a certain age and say ‘‘this is their lives’’.’ Women who are looking after their grandchildren and elderly relatives, for example, while juggling all sorts of other responsibilities are likely to identify closely with Zoë’s Gail and her best friends. Catch Girlfriends, which promises to be emotive and authentic, on 3 January (ITV1, 9pm) in the UK and 29 January in the US (Acorn TV).